74 • March 2019 • S I G N & D I G I T A L G R A P H I C S B Y R I C K W I L L I A M S Shop Talk One-Man Billboard, Part II Breaking down a large project into small parts The concept at least is simple, and it wasn't long until I was cutting, drilling, fabricating and welding all the parts to make this substantial "kit," where every part of it would be assembled on the jobsite virtually solo. In the end, most of the site work would be done over the long Thanksgiving weekend, taking out some time to take part in feast and fellowship with family, but greatly enjoying the good weather we had and catching up on getting the project off my list. The photos will mostly tell the story, and I am sure there are variations of what was done that would work just as well. In the end, I might have done a thing or two differently (and that will be described here), but as far as making a tinker toy-like kit assembled step by step with manageable pieces, that aspect of the project was fairly well accomplished. And it was very nearly a one-man job, a large one, so a lot of the photos won't have anyone in them since I was the only one there most of the time. The start was to make the posts, which in one piece would be quite heavy and require a crane to erect, actually in three parts each (total of 6 parts). Basically, there was a 5' 3" section of 8" x 8" tubing that went in the ground, a 12' section of 8" x 8" sq. tubing above the ground, and a top section of 6" x 6" tubing that would be totally concealed by the sign face itself. No piece ended up weighing over 200 pounds, and four of the six weighed a whole lot less. With no one in the bucket at all, lifting 200 pounds, though surely not generally recommended, was easy enough to do. I know that since I weigh nearly that much and my life depends on it lifting me all the time. The foundation sections were set in concrete a bit over 5' deep in holes I dug by hand, which is good exercise for a 64-year-old. My tractor was down at the time, and we'd had quite a bit of rain, so how hard could it be? Well, it would be a good workout, that's for sure. My son Slade showed up to guide the second stage main posts in place over 1" studs protruding from the first section, resting on adjustable leveling nuts. The final upper piece of each post did not weight much and was easily lifted. A 10' step ladder got me to the point of connecting the two. With studs and leveling nuts used everywhere, getting things straight and true was very easy. Except for the face panels, I brought the entire sign structure over to the jobsite on one trailer, reduced to manageable pieces and already powder coated. Each frame consisted of an upper crossmember of 3" x 3" aluminum tubing, and a lower cross- member exactly the same size, and " C"-shaped frame members at each end defined the rectangle. 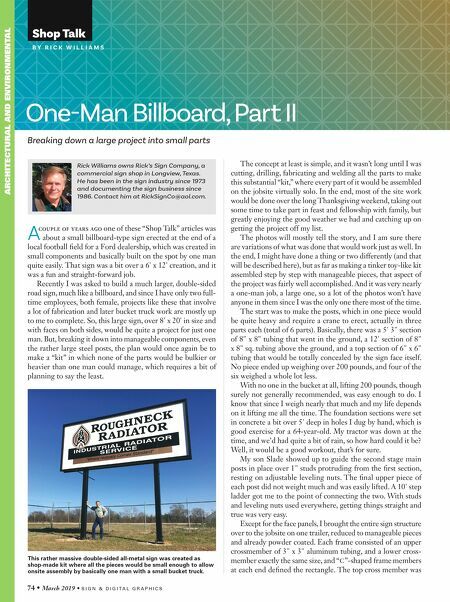 The top cross member was A couple of years ago one of these "Shop Talk" articles was about a small billboard-type sign erected at the end of a local football field for a Ford dealership, which was created in small components and basically built on the spot by one man quite easily. That sign was a bit over a 6' x 12' creation, and it was a fun and straight-forward job. 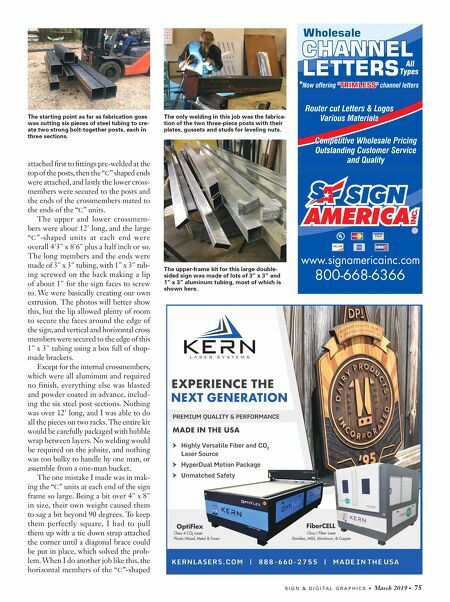 Recently I was asked to build a much larger, double-sided road sign, much like a billboard, and since I have only two full- time employees, both female, projects like these that involve a lot of fabrication and later bucket truck work are mostly up to me to complete. So, this large sign, over 8' x 20' in size and with faces on both sides, would be quite a project for just one man. But, breaking it down into manageable components, even the rather large steel posts, the plan would once again be to make a "kit" in which none of the parts would be bulkier or heavier than one man could manage, which requires a bit of planning to say the least. Rick Williams owns Rick's Sign Company, a commercial sign shop in Longview, Texas. He has been in the sign industry since 1973 and documenting the sign business since 1986. Contact him at RickSignCo@aol.com. ARCHITECTURAL AND ENVIRONMENTAL This rather massive double-sided all-metal sign was created as shop-made kit where all the pieces would be small enough to allow onsite assembly by basically one man with a small bucket truck.